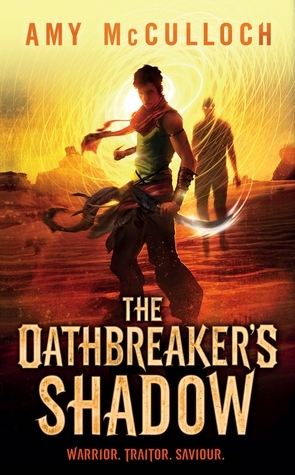 In a market saturated with YA dystopians, Amy McCulloch’s The Oathbreaker’s Shadow stands out by turning to the past. Not necessarily a historical past, but rather a classical take on story telling. McCulloch’s style of world building is reminiscent of Lois Lowry’s in The Giver in a setting reminiscent of Frank Herbert’s in Dune, and while Oathbreaker’s Shadow is less allegorical than The Giver and so far less epic than Dune, it contains that vital sense of classicism that I hope will make this series endure for generations to come. In this book, promises are represented by knots and bound by magic. When someone breaks a promise, their knot disappears and leaves behind a scar that marks them as an oathbreaker and leads to public shame and exile. For Raim, he has had a knot since the day he was born, which represents a promise he does not know and cannot possibly have made himself. So when he vows lifelong fealty to his best friend and his society’s future Khan, and this knot is broken, Raim sets off on a quest to discover what promise he had inadvertently broken, and more importantly, to reclaim his lost honour. I cannot say enough good things about this book, and highly recommend it to anyone who enjoys a good tale. McCulloch weaves Eastern philosophy, magic, and social and political conflict into the classic quest narrative of the disgraced hero. It’s a tradition that stretches back to ancient literature, and Oathbreaker’s Shadow serves as a testament to the enduring appeal of the classics as well as rejuvenates the form with a contemporary feel. This is an exciting new take on fantasy, and a much needed breath of fresh air in a market too enamoured with trends. Oathbreaker’s Shadow is high adventure; friendships are strained, loyalties are betrayed, and hope arises in the most unlikely place. All this occurs in a world where magic is real, and literally burned into your skin, or embodied in a shadowy form. As with all good examples of fantasy literature, this book feels emotionally real. Oathbreakers are haunted by shadows of people they’ve betrayed; the more egregious the betrayal, the stronger one’s shadow is. It’s a compelling metaphor, and one can only imagine how it must feel to have a shadow of a loved one (literally, a shadow of them, a mere shade of their personality) as a constant reminder of your betrayal. When one character’s hunger for knowledge leads to a realization on how to use this magic to their advantage, the results are horrifying. A scene near the end revealing the extent of one character’s betrayal feels painfully real, and despite its personal nature, feels akin to epic tropes. The Oathbreaker’s Shadow is a brilliant book, the first in a series of two. It deserves to become part of classic YA literature, and I highly recommend it to readers of all ages. This entry was posted in Book Reviews and tagged 50BookPledge2013, Fantasy, Fiction, Random House, YA by Jaclyn. Bookmark the permalink.